In this published form of the 1997 Staley Lectures delivered at Southeastern College in Lakeland Florida, John Christopher Thomas explores the Farewell Materials in the Gospel according to John. Following a brief discussion devoted to the nature of biblical narrative, the concentric structure of this text is explored. 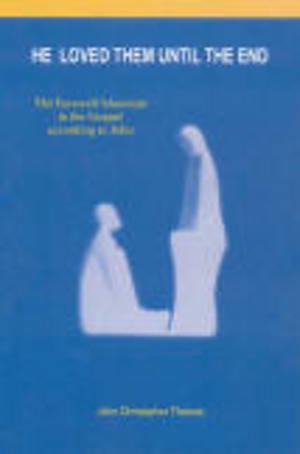 Individual lectures are devoted to the signs of cleansing with which the Farewell Materials begin and end (the Foot Washing and the Prayer of Jesus); the passages devoted to the themes of Departure, Betrayal, and Provision; teaching about the Paraclete; and those that underscore the solidarity the believers have with Jesus. The book concludes with the implications of the Farewell Materials for Pentecostal Theology and Ministry.